This year’s Antarctic season is gearing up to be an entertaining one for cycling enthusiasts, with three adventurers planning separate solo expeditions in an effort to become the first person to take a bicycle (or tricycle) from the edge of the continent to the South Pole. Currently, Spanish explorer Juan Menendez Granados and Utah bike shop owner Daniel Burton are waiting out a storm in Punta Arenas, Chile, while they make final preparations to start their trips at the Hercules Inlet. Meanwhile, a British woman, Maria Leijerstam, has recently announced her own attempt, which will begin December 18 on a different, apparently untested route. She plans to traverse the crevasse-ridden Leverett Glacier for 150 kilometers before turning due south on the polar plateau toward the South Pole, some 650 kilometers ahead. Leijerstam’s 800-kilometer route is shorter, mileage-wise, than the route Granados and Burton will travel. 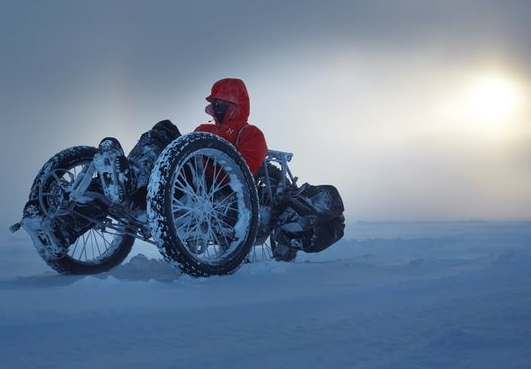 And unlike the men, who will be riding standard fat bikes, Leijerstam will be using a recumbent tricycle, developed by experts from Inspired Cycle Engineering of Cornwall with the challenges of Antarctic travel in mind. Maria’s White Ice Cycle expedition has apparently been kept a secret as she’s developed the plan and the equipment, and trained by participating in endurance races such as the Black Ice Race, pedaling a studded-tire bicycle across the 650 kilometers of wind-blown ice on Lake Baikal in Siberia. She’s trained with her tricycle in Iceland and Norway, spent an entire day riding a bike trainer in a freezer at 20 below, and has sought coaching from seasoned Antarctic travelers. For all of the unknowns ahead, she’s set an ambitious schedule — around 20 days — and will carry 45 kilograms of food and supplies — somewhat light relative to other unsupported treks across Antarctica. It will be a race against dwindling food and fuel to pedal 500 miles to the South Pole — and, like Granados and Burton, she hopes to be the first to get there. As a winter bicycle touring enthusiast, I’ll be most interested to see not only whether these cycle trips to the South Pole will prove successful, but also how they’re achieved. Each participant has a slightly different strategy: Granados will be dragging two sleds at the start and using skis, while Burton will have a sled and pannier gear set-up and carbon fat bike. All set-ups will likely have both advantages and disadvantages in terms of float on the snow crust. However, it seems likely that the most difficult obstacle will be wind, which blows at near-constant gales from the south — meaning the cyclists will have to deal with the challenge of consistent strong headwinds in addition to deep subzero cold, occasional whiteout fog, and blizzards. Any bicycle tourist who’s pedaled a loaded bike into a headwind on an open plain will understand just how debilitating wind can be. A few years back, while on a bicycle tour across Nebraska, I encountered a south wind blowing sustained at 40 to 45 mph and gusting up to 60 mph — enough to blow me off my bike if it blasted from the side. Pedaling directly into the wind, I struggled to achieve a pedaling speed of 5 mph, despite a lung-busting effort. And this was the case on hard pavement, with gear and a bike that, while heavy for a bike tourist, only added up to about 80 pounds. Add the abrasive resistance of sand-like snow, loose snow on the surface of the harder crust, frequent sastrugi — or wind-hardened snow formations, and expedition loads, and you have an equation for an extremely strenuous undertaking. Given the human limitations of even the most trained endurance athletes, one wonders just how fast a bicycle can even move in Antarctica, or how much ground it can cover. Based on the handful of expeditions attempted so far, it seems distances around 15 to 20 miles a day — a standard skier’s pace — are to be expected. Although Leijerstam’s recumbent position will likely provide an aerodynamic advantage, it goes without saying that the strongest cyclists will prevail in the face of relentless winds. Not that pedaling a bicycle at walking pace is a bad thing, but it does beg the question of whether cycling is really a reasonable form of travel in Antarctica, or just a novelty or something to be sought after right now because it hasn’t been done before. With three expeditions setting out soon, there should be more insight into the puzzle of bicycle travel in Antarctica after this season. Daniel Burton will be supported by snowmobiles – http://forums.mtbr.com/fat-bikes/south-pole-epic-843182.html. He’ll ride a bike the whole way with the snowmobiles carrying all the gear. That guy has no experience in cold weather biking whatsoever it sounds like? He nixed the snowmobile plan earlier this year when funding fell short. Now it’s just a solo expedition with a few supply drops from ALE. And his winter expedition and snow cycling experience is quite limited indeed — effectively short winter camping trips in the mountains of Utah, mostly as a youth, and bike commuting and recreational cycling in the Utah Valley. He didn’t ride a fat bike or do any winter trail riding until late last year. I’m among many who believe it’s a pretty incredible leap to go from this to Antarctica, but one can only assume he did his homework. I hope the best for him. 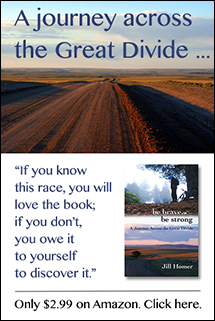 If you didn’t get the press release, there’s a copy here on a recumbent ezine. P.s. If that link doesn’t work the home page is http://www.bentrideronline.com with a jump to the press release off the lead article. I just finished up David Roberts, “Alone on the Ice”, he writes a lot about the challenges of wind! Getting into a more aerodynamic position sounds like a good idea, but going through a, “crevasse-ridden” area does not. Roberts book talks about one team going through such a region, barely making 10 miles a day, if they were able to move at all. One crevasse was so huge (and undetectable), that it swallowed up an entire sledge, the dog team, and the person commanding it, never to be seen again. I’m always intrigued on how an individual is supposed to cross crevasses, without any sort of safety measure – a rope to someone else, for example. There’s def. differences between traveling on frozen ice, on top of a body of water, and traveling through a river of ice. Man, 5mph! Slow in one sense, but if these early 20th century explorers could go more than 15 miles in a day – pulling a loaded down sledge by themselves, it was cause for much celebration. These same explorers never got the gist of skis either. A pretty big blunder. Wow…crazy stuff! I’m rooting for them all, but my ‘vote’ will be for Maria and her tricycle…IF she can get it past/around all the crevasses she will encounter, I like the lower stable position. I think hour to hour/day to day slogging lower to the ground will win out over an upright bike. Kudos to them all for trying though…thanks for keeping us updated Jill!